S.S. Connemara and the Coal Carrier Retriever Sinking in 1916. Early on the morning of Friday the 3rd of November 1916, Captain Patrick O'Neill of the coal carrier Retriever steered his ship out of Garston's Coal Docks near Liverpool, heading for Newry in Northern Ireland, with a crew predominantly from the destination town. Due to the extreme weather conditions by the time the Retriever was off Ireland her cargo of coal had shifted, and she was probably somewhat unstable. Later that day, the 50 year old Captain George H. Doeg (born near Carlisle), and his ship the S.S. Connemara, left Greenore for Holyhead, with a crew predominantly from the port town of Holyhead on the Isle of Anglesey in North Wales. The Connemara was a daily ferry between Holyhead and Greenore that carried passengers, livestock and cargo, and whilst it was wartime, and there was an ever present threat from German U-Boats patrolling the Irish sea, to the Captain's wife Mary Doeg it would have seemed that her husband had left on a routine journey, and that he would return the next day. Neither ship or their crews, nor the families of the crews and passengers aboard, were aware that the fate of both ships were intertwined, and fatally sealed. The night of November the 3rd 1916 was a particularly dark night, but because of the danger of German Submarines both ships operated with just mininal lighting. In gale force winds and mountainous seas the two ships collided off Carlingford Bar, despite the lighthouse keeper from the Halbowline lighthouse firing flares to warn them they were too close. The Retriever collided with the S.S. Connemara, holing her amidships. Invariably - I have found during research - when a steamship sinks, the boilers explode on contact with the sea, and thus the S.S. Connemara slipped beneath the waves within minutes. The Retriever took a little longer, but she also sank to the bottom. 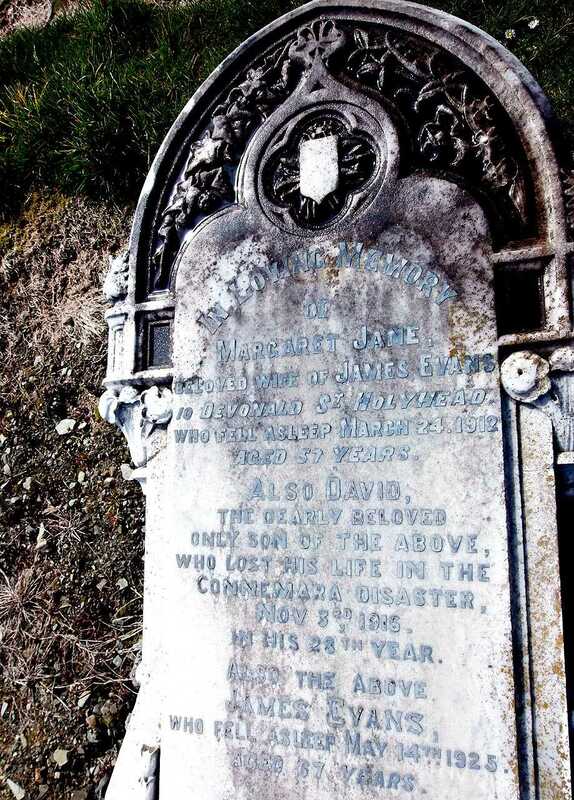 Just one man would escape this terrible accident, James Boyle of the Retriever, a 20 year old Fireman. He seldom spoke of the disaster, at least until he was an old man, and he subsequently passed away in 1967. The next day washed up over 50 bodies, they were mutiliated by the boiler explosion, rough seas or rocks. Over the next weeks bodies were washed up on beaches, and identification of the corpses was nigh impossible, having to rely on e.g. clothing and jewellery. 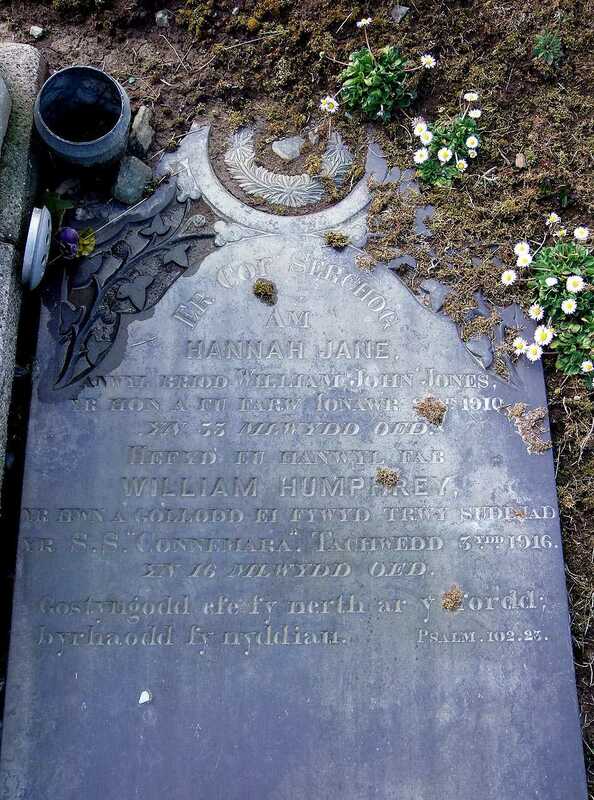 In Holyhead the crew are listed on the War Memorial, and some of the crew members are mentioned on their family graves, and in Ireland there was a military funeral with honours to an Unknown Soldier at St Patrick's Churchyard in Newry. where there is a memorial. Several of the soldiers lost on the Connemara are remembered at the Hollybrook Memorial in Southampton, and the schoolchildren of Kilkeel High School erected a stone memorial in Kilkeel Cemetery. 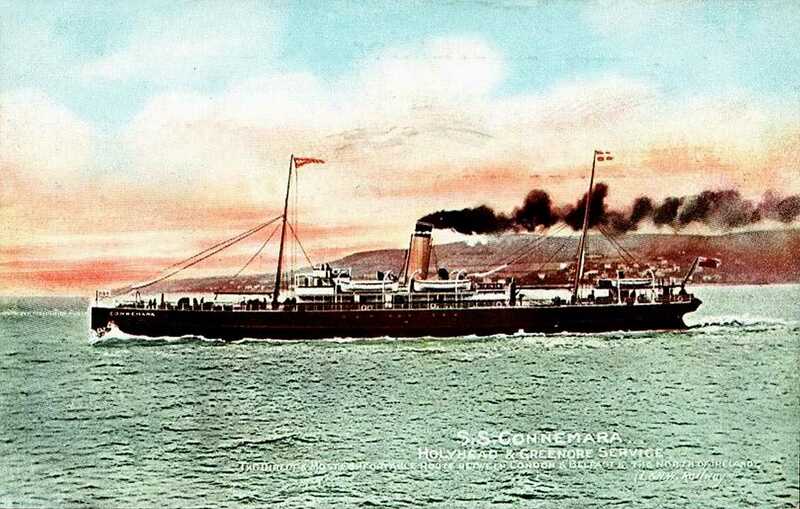 There were in excess of 90 casualties in total, 31 of which were the Holyhead crew of the Connemara, along with 51 of her passengers, and on the Collier Retriever, 8 of the 9 crew lost their lives. Captain George H. Doeg is believed to have been buried in Irealand. A memorial to the Connemara was held at St Cybi's Church in Holyhead in November 2006. I have tried to put on this webpage as much information as I can about the crews and passengers, all of which will have been researched by a number of people, and I thank them. I just hope having all the information in one place will make it simpler for anyone researching this incident. If you have any high res photographs of the Retriever and/or the crews of either ship, or even addirional facts or family anecdotes I would love to add them to this page. Please email them here. 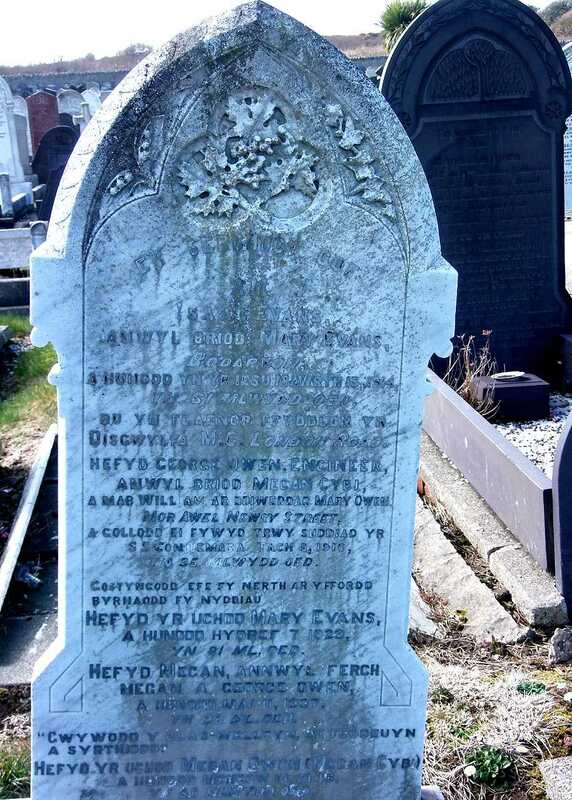 his father in law Isaac Evans, a respected elder of Disgwylfa Chapel on London Road. Parents lived at Bodarvon, Holyhead. Later his mother in law and wife - Megan Cybi - would join them. 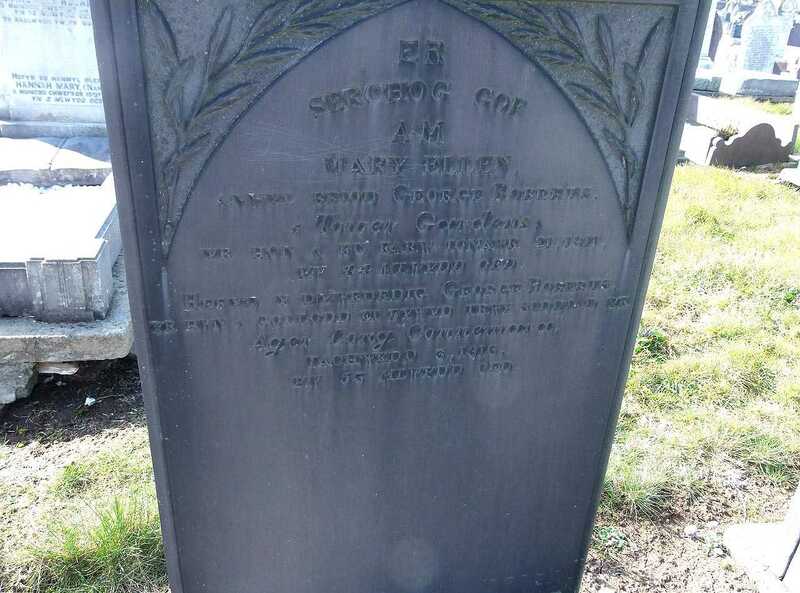 George Roberts, Leading Stoker died Connemara 1916 aged 53 - buried with his wife Mary Ellen Roberts. Lived at 5, Tower Gardens, Holyhead. William Humphrey Jones, Deck Boy died Connemara 1916 aged 16 - buried with his mother Ellen Janes Jones. His father was William John Jones, and as he is not buried here one can reasonably assume that he re-married after losing his wife who was aged just 33. Here are the lists that I have been able to put together from a multiple of internet resources - It is about two thirds complete. Private. On the Hollybrook Memorial. Gunner. On the Hollybrook Memorial. Husband of Mary Doeg died in 1918. Son of James and Jane Evans. Private. Brother of Mary Barry. On the Hollybrook Memorial. Buried with his mother who had died in 1910 aged 33. Survived collision but was killed on the rocks. Private. Remembered on the Hollybrook Memorial. Children John aged 6, Clare aged 4, and Veronica 6 months. Son of William and Mary Owen of Bodarvon, Holyhead. Sergeant. On the Hollybrook Memorial. Husband of Mary Ellen Roberts died 1911 age 44. 5, Tower Gardens. Buried with his wife.